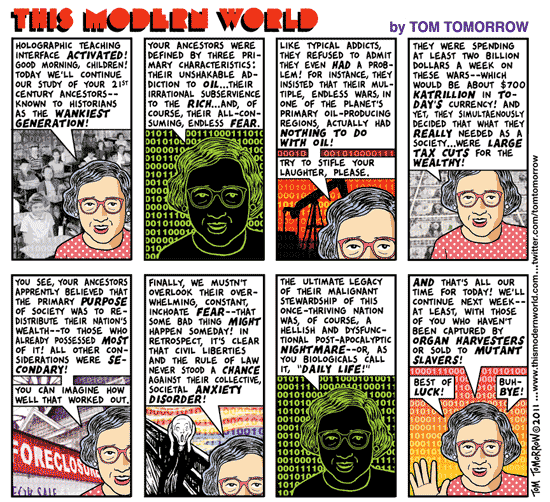 I realized recently that I had not read any of Tom Tomorrow’s “This Modern World” comics in quite some time, so I spent several hours reading the archives on DailyKos. The conclusion that I’ve come to after having read so many TMW comics in a row: If I had access to the big red button that would wipe out all of humanity today, I think it would be really hard not to press it. Politics are simply the worst thing ever invented by humankind and should never be allowed to spread beyond our planet. Ugh. Check out the rest of TMW’s archives yourself, if you have a strong mind for such things.